T-shirts, mugs, badges and bags galore! For a limited period we will be giving away this fabulous poster FREE with any order. Order today! 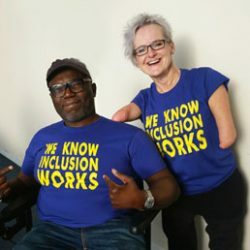 We’ve had these t-shirts printed in a gorgeous blue/purple with yellow print. 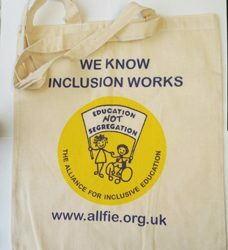 They say ‘WE KNOW INCLUSION WORKS’ on the front with the ALLFIE logo and web address on the back. The t-shirts are soft and good quality. Order yours today for the bargain price of £8! (+p&p) If you want more than one you can change this in the shopping cart. 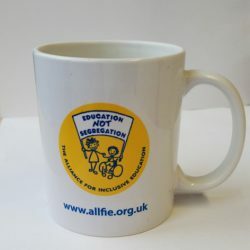 To celebrate 25 years of campaigning for inclusive education, we’ve produced these great mugs with the ALLFIE logo on the front and a 25th anniversary logo on the back. 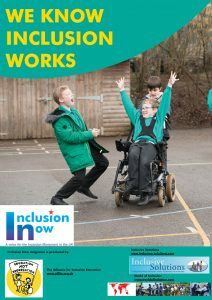 Order now while stock lasts! Only £6 each (+p&p). If you want more than one, you can change this in the shopping cart. 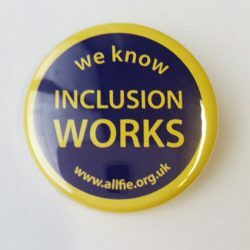 “We know inclusion works” badge. £0.99 each (+p&p). If you want more than one, you can change this in the shopping cart. These great 100% cotton shopping bags are a mere £2.99 each (+p&p). If you want more than one, you can change this in the shopping cart.